During the recent 2006 NMS Scientific Sessions in Brooklyn, New York, I had an opportunity to meet and discuss various research findings with Dr. Barry Sears, author of the Zone diet. One item we talked about was the recent JAMA publication that I wrote about earlier this month - JAMA Publishes Findings of Seven Year Low-Fat Diet Study - where I highlighted the increased risk from an increase in waist-hip ratios and waistline measurements in the study participants. An even closer look at the results find something odd - over the seven years, even with the calorie restriction of both groups, neither had an appreciable weight loss. More startling, both groups experienced an increase in their waist hip ratio (WHR) due to an increase in the size of their waistline - a measure we now understand is important in assessing health risks. This particular study was a "hot topic" of conversation amongst many of those in attendance at the conference because the results were so skewed by the media and within the press releases from JAMA. Earlier this week, Dr. Sears issued a press release about this study - Lose Weight, Gain Fat on Low-Fat Diets? - where he rightfully points out that, "The women in the low-fat group were consuming 361 fewer calories per day during the study, Sears said, which means that they should have lost approximately three pounds per month as opposed to the actual two pounds lost in seven years. "This suggests that a calorie is not a calorie when it comes to weight loss and even less so when it comes with an apparent long-term increase in body fat," he said." From my conversations with Dr. Sears, it is this type of increase in body fat - even with no gain in body weight - that may provide the catalyst that increases inflammation in the body. Back in July I wrote about the insidious effects of low-level, chronic inflammation in the body in my article Death by Inflammation. Advanced Glycation End (AGE) products, are formed when food is cooked at high temperatures. AGE's are toxins in the body and some are now calling them "glycotoxins". According to a Proceedings of the National Academy of Sciences study, consuming foods cooked at high temperature accelerates the glycation process, and the subsequent formation of advanced glycation end products. When you eat foods with AGE's your body responds with inflammation to try to protect itself. Sleep Deprivation. In 2002, researchers at the annual meeting of the Endocrine Society held in San Francisco reported that sleep deprivation markedly increases inflammatory cytokines. Getting a good night sleep allows your body time to build and repair tissue - a process that is inhibited during waking hours. Damaged Fats. Oil starts to degrade upon heating and over a relatively short period of time, within 30-minutes, 4-hydroxy-trans-2-nonenal (HNE) begins to reach critical levels. HNE's are toxic in the human body. Trans-Fatty Acids. Man-made trans-fats are disruptive in the body since they are not natural and the body does not know what to do with them. High Blood Sugars and/or Insulin Levels. It is well documented that high blood sugar and/or insulin levels produce inflammation in the body. Quite frankly, our bodies are simply not designed to handle the excessive amount of sugars we eat daily. Prolonged elevated insulin levels disrupt cellular metabolism and spread inflammation. Nutrient Deficiency from any number of vitamins, minerals and elements along with essential fatty acids (specifically omega-3) and essential amino acids. When your body does not have all the ingredients it needs for health, it makes do with what it has for survival and makes compromises. In that compromise process, it also works to protect itself and inflammation is one result of a nutrient-poor diet. Stress, an often over-looked component in chronic inflammation. When you are stressed, your body releases a number of hormones and chemicals to try to counteract the affects of the stress. Chronic stress means constant elevated levels of stress hormones and inflammation. Relaxation, meditation, exercise and simple general activity all help to reduce stress and thus reduce stress hormones in the body. If you look carefully at the above list, every last item you control. The most important factor you control is what you eat. The seven-year study published in JAMA is a testament to how a long-term low-fat diet, even with calorie restriction, increases body fat and thus, increases your risk for inflammation and poor health in the long-term. Dr. Sears is convinced that inflammation is at the root of many of our health ills - so convinced he founded the Inflammation Research Foundation that is "dedicated and committed to providing resources and funds for both education and medical research projects on the use of highly effective nutritional approaches for the treatment of chronic diseases associated with inflammation in adults and children." While I don't think the Zone diet is the "cure all" or appropriate for everyone, it does have merit and is supported by evidence as one more dietary approach to consider for the long-term if your goal isn't simply weight loss, but also includes health gains in the long-term! Yesterday I pointed out the weight loss discrepancies, based on calorie intake of participants following various diets in a study published earlier this month in JAMA - Comparison of the Atkins, Ornish, Weight Watchers, and Zone Diets for Weight Loss and Heart Disease Risk Reduction. When viewed solely from a "calorie in - calorie out" perspective the results suggest that calorie intake alone is not the single determinant of weight loss. This is something I've been saying for years and still remain surprised when, at the end of a study where weight loss does not jibe with calorie intake, researchers fail to question why! They are quick to state weight loss that is aligned with calorie intake, which is almost always from a short-term period - so why ignore the question of why, over time, "calories in-calorie out" fails to produce predictable weight loss? That's just one question I have. Another is why didn't the researchers in this study make it clear that none of the groups followed over the year were able to follow the rules of their diet? And, why didn't they acknowledge that even during the initial intensive start period, where education and support were provided, the groups couldn't follow the "rules" of each diet? For example, those assigned to the Ornish diet were supposed to limit fat intake to just 10% of their calories, yet consumed 17% of their calories from fat during the first two months of the study. By the end of one-year the group was averaging 31.6% of their calories from fat. This group was clearly not following the Ornish diet! Nor did the group assigned the Atkins diet actually follow the Atkins diet rules. If they had followed the rules, at the end of month one they would have consumed just 30g of carbohydrate as part of their diet, and just 50g of carbohydrate by the end of month two. Instead, during this two month period of education & support, this group consumed an average of 68g of carbohydrate in month one and 137g of carbohydrate in month two. Hello! This group was not following the low-carb Atkins diet! In fact, none of the groups got the macronutrient ratios of their diets right. Those on Ornish and Zone ate way too much fat for their diet; those on Weight Watchers ate too much fat with too little carbohydrate; and those on Atkins ate too much carbohydrate with too little protein. If nothing else this study tells us one thing - how to waste time and research money. Those conducting this study failed to properly educate their participants and encourage adherence to the dietary rules of each plan. They did have ample opportunity to do so in the first eight weeks of the study and from their own data it is obvious they didn't accomplish such an important part of the process required to start and follow a dietary approach - basic education of their participants. So, at the end of one-year this study tells us nothing and was nothing more than a waste of research dollars. A study was published in JAMA - Comparison of the Atkins, Ornish, Weight Watchers, and Zone Diets for Weight Loss and Heart Disease Risk Reduction - a couple of weeks ago, before I was in major "conference prep mode" that I wanted to write about. It was published around the same time as the study - Low-Fat Dietary Pattern and Weight Change Over 7 Years - that I've previously written about. Interestingly, this comparison study received little, if any, media attention. Now that the 2006 NMS Scientific Sessions are complete and I've had a mini-vacation to relax a bit, it's time to get back to the business of analyzing some research! As I read through the study data, something interesting popped out - none of the participants, in seems, were able to actually follow the rules of the diet they were assigned to follow. That tidbit, in and of itself, is another article. For now, I'd like to concentrate on something much more intriguing that comes to light when you look at the actual calorie intakes and compare that to the weight loss numbers. The first clue that something is "just not right" is found it what is not said - there is no statement or acknowledgement that the weight loss experienced by participants is accounted for by the calorie restriction each diet imposed. Well, first of all it's highly unlikely that a group of 200+ pound people are consuming just around 2000-calories a day at baseline and sport a BMI of 35 on average! So, that's our first clue that the study has what is called a "reporting bias" caused by those participating under-reporting their actual food intake at the start of the study. But, let's pretend that is really all they were eating, OK? Now look at just how significantly calories were restricted on some of the diets. The folks in the Zone managed to reduce calorie intake over the first month by 642-calories a day, then in month two they managed to keep calories reduced by 625-calories a day below their baseline start calorie intake, followed by an average of 173-calories less a day in months 3-4-5-and-6 and an astounding 302-calories fewer over the last six months. So, where's the 32-pound weight loss expected with such a calorie restriction? Why did these folks manage just 7.04-pounds of weight loss? Was this just a phenomenon of those in the Zone? Not exactly. In fact, all groups had calorie restrictions that should have resulted in greater weight loss. 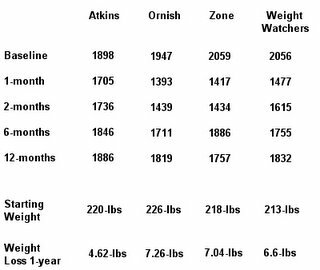 The calorie restriction of the Ornish group should have resulted in 23.76-pounds of weight lost, in the Weight Watchers group a weight loss of 30.78-pounds should have been realized and in the Atkins group, the expected weight loss should have been 5.4-pounds. The Atkins group, even though they were obviously not really following a "low-carb" diet, should have had a predictable weight loss of 5.4-pounds and lost 4.6-pounds? That's mighty close to the expected weight loss, especially when we compare how poorly the other groups did when compared with their calorie restriction! What prevented the other groups from not losing the weight they should have based on the Calorie Theory (calories in versus calories out)? Call me crazy, but 1300, 1400, heck even 1600-calories a day is simply too few calories for someone weighing an average of 220-pounds with an average BMI of 35. After reviewing the amount of carbohydrate consumed by those supposedly following Atkins, I'm not surprised they lost just 4.6-pounds in a year - they were eating too many carbs to effectively burn body fat! But, they were eating more calories each day - enough to support weight loss without throwing their metabolism into "starvation mode" where the body thinks it is in a famine and really conserves energy rather than burn it. I would wager that if they'd actually followed Atkins - actually kept their carbohydrate intake at levels recommended by Atkins - they would have seen some impressive weight loss! Too bad the researchers didn't make sure each group actually was following the plan assigned during the first two months where support and intensive education was part of the design protocol. I've received a number of emails since my article, Diabetics Must Demand Accountability from the ADA on Monday - with the vast majority thanking me for taking a strong stand on the issue. First, let me say that I do think the American Diabetes Association (ADA) should be important to those with diabetes, and even those with pre-diabetes or metabolic syndrome. Because of their prominent and trusted role in the lives of those with diabetes, they should be held accountable for the progress, or lack thereof, made in finding a cure. And that was the point of my article - hold the organization, that is the leading health authority for the disease, to a high standard and expect progressive improvements in your health not simply better medical management techniques. That isn't to say those medical interventions are not important - they are and they save lives. What they do not do is stop the progressive damage within the body - they only slow it down. Such treatments should not be viewed as the best we can do or the best we can hope for when the research data shows that there are natural, dietary interventions that may hold the key to finding a cure for Type II Diabetes! Dare I say we may already have that key? But, before we can consider the idea that a cure for Type II Diabetes is possible, we must first have a working definition of of "cure." Some will argue that there is no cure because diabetes is a lifelong, progressive, chronic disease and even if you can somehow manage it, even without medication, it does not change the fact you still have diabetes. There are others though, with definition of "cure" from other diseases and conditions where the term "cure" is applied who hold that, if by definition you're considered diabetic when you are placed on medications to manage the condition, then you are no longer a diabetic if you are able to eliminate the need for medication through whatever means - diet, exercise, etc. - and do not present symptoms that meet the definition of diabetes. For the purpose of this article, let's start to consider "cure" as you no longer meet the strict definitions established for a diagnosis of diabetes and no longer require medication to control blood sugars and/or insulin. improvement in fasting blood sugars to a level that indicates one is no longer meeting the criteria to be diagnoised as "diabetic"
improvement in post-prandia glycemia & insulin secretion so that medication is no longer necessary and one is no longer meeting the critera to be diagnoised as "diabetic"
normalized HBA1C levels so one is no longer meeting the criteria to be diagnoised as "diabetic"
So, then - can we cure type-II diabetes? If various research studies investigating dietary interventions are correct, and we even use the strict definition we have above, than yes, we can cure diabetes. First, the problem - a low fat, high carbohydrate diet in combination with regular exercise is the traditional recommendation for treating diabetes. Compliance with these lifestyle modifications is less than satisfactory, however, and a high carbohydrate diet raises postprandial plasma glucose and insulin secretion, thereby increasing risk of CVD, hypertension, dyslipidemia, obesity and diabetes. Moreover, the current epidemic of diabetes and obesity has been, over the past three decades, accompanied by a significant decrease in fat consumption and an increase in carbohydrate consumption. This apparent failure of the traditional diet, from a public health point of view, indicates that alternative dietary approaches are needed. Because carbohydrate is the major secretagogue of insulin, some form of carbohydrate restriction is a prima facie candidate for dietary control of diabetes with the potential to reverse the condition and perhaps cure type II diabetes. A study published in 2004 - Glycemic optimization may reduce lipid peroxidation independent of weight and blood lipid changes in Type 2 diabetes mellitus - in the journal, Diabetes Nutrition & Metabolism, showed great promise for the standard ADA recommendations. The data showed some improvements in those following the diet for 8-weeks and is often cited as "proof" the recommendation for a low-fat, high-carbohydrate diet works. But, if we use our definition of "cure" above, does the data support the idea that this type of dietary approach will lead to one being "cured" of their diabetic condition? By our strict definition for "cure" bove, this dietary approach will not lead to one being cured of diabetes. The improvements above will most certainly slow the progress of the complications, and may even require less medication, but the individual with diabetes following this diet will not see a cure and will be left to continue with "medical management" of their disease and hope the worst long-term complications can be delayed as long as possible. What about other studies? Surely the literature has something within that gives us hope. Well, back in 1992, a study published - Comparison of effects of high and low carbohydrate diets on plasma lipoproteins and insulin sensitivity in patients with mild NIDDM - in the journal Diabetes, provided some very intriguing data. Researchers confined subjects to a metabolic ward for 3-weeks during each diet to ensure compliance with the dietary interventions to compare the standard ADA diet with a diet much lower in carbohydrate. Each subject was crossed-over to the other diet for three-weeks to compare effects. The two diets provided the same calories and fiber, but had significant differences in their effect. This study did not look at all parameters we've used in our definition for cure, but something very alarming did happen to those following the high-carbohydrate diet - their cholesterol was significantly impacted by the high-carb diet! The high-carb diet resulted in a 27.5% increase in triglycerides and a similar increase in VLDL cholesterol and an 11% decrease in HDL. For cholesterol levels the high-carb diet was a disaster! Are there other studies that might show improvements that meet the strict definition of cure we've established? In 1994 a study - Effects of varying carbohydrate content of diet in patients with non-insulin-dependent diabetes mellitus - was published in JAMA. In this 8-week study, researchers investigated the difference between a high-carbohydrate diet compared with a lower carbohydrate, high-monounsaturated fat diet. Again, the high-carbohydrate diet was disasterous as it resulted in increased fasting plasma triglyceride levels and very low-density lipoprotein cholesterol levels by 24% and 23% respectively, and increased daylong plasma triglyceride, glucose, and insulin values by 10%, 12%, and 9%, respectively. Plasma total cholesterol, low-density lipoprotein cholesterol, and high-density lipoprotein cholesterol levels remained unchanged. The effects on plasma glucose, insulin, and triglyceride levels persisted for 14 weeks after the diet was abandon. These last two studies were done 12-years ago and during the time since, the ADA has remained staunch in it's high-carbohydrate, low-fat recommendation. Twelve years ago, we had the start of some very compelling data that suggested we continue to study a dietary approach that was lower in carbohydrate as a dietary intervention for those with Type II Diabetes. Well, if we look through the literature, we find that researchers often adjusted their study design and rarely compared the high-carbohydrate diet to a lower carbohydrate diet again until 1998, when a study - Utility of a Short-Term 25% Carbohydrate Diet on Improving Glycemic Control in Type 2 Diabetes Mellitus - was published in the Journal of the American College of Nutrition. While this was another short-term study, this one did look at a number of items from our definition above. The researchers noted that "In those subjects on sulfonylurea therapy, the improved glycemia was achieved despite discontinuation of the oral hypoglycemic agent. " This is our first glimmer of hope in the literature that diet alone may indeed hold the key to cure. One would think the above results would have sparked a renewed interest in researching comparitive studies of high-carbohydrate versus low-carbohydrate diets for diabetics? Unfortunately this study did not tell us if those within the study were able to eliminate their medication or not with the dietary intervention. And, get this - while this study was just six months, the researchers noted that the improvements persisted in the six months following the end of the study! That's ONE YEAR of measurable, real metabolic improvement in study participants who had diabetes and through diet alone were able to eliminate their medications! The researchers again noted that the low-carb diet affected "markedly improved glycemic control and insulin sensitivity." Here we have three studies since 1994 - a period of twelve years - that show elimination of medications of those with Type II Diabetes. Yet, in tweleve years we still have NO long-term study data because we have no longer term studies done specifically using this dietary intervetion to actually see if reducing carbohydrate has a lasting effect in those previously diagnoised with diabetes who, by participating in a study, were able to eliminate their medications because of a low-carb diet! The above studies are publically available, so the ADA is well aware of them. Even if, in the last twelve years they wanted to remain cautious in their recommendations - totally understandable - why in the world have they not committed funding to a large, well-controlled, long-term study to investigate the long term effect of a carbohydrate restricted diet? The last twelve years has been lost to us for data collection - it's gone, time we cannot get back. The ADA knows the data about a low-fat, high-carbohydrate diet does not hold promise for a cure. They have no idea what a low-carbohydrate diet can do because they simply will not commit to investigating the dietary approach for long-term data. They are supposed to be the leading healthcare organization for those with diabetes! Why are they dismissing this potential key to the cure? Diabetes has no cure. It is progressive and often fatal, and while the patient lives, the welter of medical complications it sets off can attack every major organ. No cure and treatment that is, at best, basic triage to cope with the complications as they happen and a management plan that leads only down the path to progressive degeneration. Of course not – but it is the best the American Diabetes Association (ADA) wants you to believe we have. Low-carbohydrate diets (restricting total carbohydrate to <130 g/day) are not recommended in the management of diabetes. (E) The “E” noted after the statement indicates this recommendation is based on “expert opinion.” A cleaver double-speak for “there is no research evidence available for us to present that proves low-carb diets are bad for those with diabetes.” For decades, the ADA has maintained that diabetics need carbohydrate in their diet – the very macronutrient that aggravates and complicates their condition – and recommends 45-65% of their total calories each day come from carbohydrate. What boggles my mind is how we as a nation continue to put up with such a counter-intuitive, illogical, obviously flawed recommendation! Let me be clear here – excessive carbohydrate is the very thing that destroys a T2 diabetic’s endocrine system and metabolism permanently – so there is no reversal and only progressive degeneration of the whole body from within if the diabetic continues to eat excessive carbohydrate each day. What is excessive carbohydrate? ANY level of carbohydrate beyond what your body can tolerate, effectively metabolize and use as energy! Rather than disappoint the diabetic and tell them to face the facts and stop eating cakes, candy, cookies, pastries and such, the ADA tells those with diabetes that “sugar can be a part of your diet” and even publishes recipes for their convenience, while telling them to monitor blood sugars and keep popping pills or injecting insulin as directed. Rather than tell a diabetic the TRUTH – that their own research shows that it doesn’t matter what type of carbohydrate is eaten, if the total non-fiber intake remains the same, regardless of source, they all stimulate high blood sugars – they lull the diabetic into thinking that somehow “complex” carbohydrates offer some magic protection against blood sugar rising too high. Rather than tell the diabetic there is certainty they will progressively decline in health if they do not stop eating excessive amounts of foods that turn into glucose, they tell them to continue eating a high carbohydrate diet and progressively increase medications and then “manage” the other complications – high blood pressure, high cholesterol, high triglycerides, renal failure, etc. – with a multitude of more medical interventions. Rather than providing uncomplicated recommendations for weight loss – the single most effective non-pharmacological option available - they continue to promote the idea no one is smart enough to plan their meals without a “professional registered dietitian” at the wheel, directing what to eat, when to eat and how to prepare foods. Their menus are too often nutritionally deficient, too low in calories and too difficult to follow for the long-term – is it any wonder the majority of type II diabetics are still obese? Rather than admit their dietary recommendations are contributing to the progressive degeneration of those with diabetes, they remain staunch that this type of “treatment” is the best we have. Can you tell I’m just a bit disgusted by this being considered the “standard” treatment for someone with diabetes? I hope everyone reading this today is ANGRY! If you’re diabetic, pre-diabetic, have a family member or friend, co-worker or someone else you care about that is diabetic or pre-diabetic – you should be angry! It is time we, as a nation, start to DEMAND accountability from the leading health organizations, trusted by the nation to provide timely, relevant, evidence-based recommendations for the treatment of diabetes! The ADA survives because we, as a nation, are not demanding they be accountable to every diabetic out there who has followed their recommendations and still are declining each day. The ADA continuing to promote the idea of managing the disease symptoms and progressive complications is NOT good enough anymore. Only an aggressive campaign that openly and honestly reviews every last piece of scientific data available and comprehensively details exactly what metabolic and/or endocrine improvement is seen with each option will be an acceptable start. You see, the drugs and other medical interventions do not provide metabolic and/or endocrine system improvement – they just make you feel better while you’re body continues to degenerate and self-destruct inside. Do you want treatment to just mask your slow death or do you want real improvement in how your body systems function each day? The ADA is giving you the former – scientific research data already holds the latter. The ADA tells you this scientifically supported approach is unbalanced and will lead to kidney damage, heart attacks, high cholesterol and other health problems. The ADA just refuses to accept it works and continues to tell you to ignore it, dismiss it and forget trying it since it is unhealthy. It’s called carbohydrate restriction – the fastest, most effective dietary treatment to reduce or eliminate your dependence on medications to control your blood sugars, reduce your weight and thus increase your insulin sensitivity. All of which are real, measurable improvements within your body and not just “medication induced” improvements that do nothing to stop the progressive complications you are facing in the long-term! Demand the ADA begin to tell you the truth about restricting carbohydrate in your diet! Demand the ADA begin to give you actual IMPROVEMENT in, not just medical management of, your metabolism, endocrine system and thus, your diabetes! Last month I wrote about the scathing editorial in the journal Nature that called into question the integrity of Dr. Manny Noakes and Dr. Peter Clifton, authors of the CSIRO Total Wellbeing Diet, in The Emperor has no Clothes. Well, it seems raising concern, heck even outright attack on these two researchers, in a scientific journal wasn't enough. As reported in Questions raised over CSIRO diet - a nutritionist, Rosemary Stanton, and a medico, John Tickell, have taken their concerns to the government of Australia and requested that the Prime Minister, John Howard, review the diet. The pair wrote to Mr Howard, saying the high meat content in the diet contravenes the government's own dietary advice. A book isn't aligned with government dietary guidelines and therefore is subject to review by the government? Do these two concerned healthcare professionals understand they are asking their government to censor a book? Not only that, they're asking the government to censor its own scientific findings that were the foundation of the book. CSIRO is a government agency in Australia. Dr. Noakes and Dr. Clifton are researchers at CSIRO and had approval from that agency to write the book! Since when are findings, from scientific studies - eight years worth of data - that are contrary to current belief up for censorship? This is just the beginning of what I believe is going to be a concerted effort to suppress scientific inquiry into dietary approaches that contradict various government recommendations both here and abroad. Such attempts to censor what researchers study, find, conclude and write about is outrageous. RunnersWeb.com yesterday had an article written by Kimberly Mueller-Brown, MS, RD - Science of Sport: Are the Atkins, Zone, and South Beach Diets Slowing you Down? Ms. Mueller-Brown is obviously convinced that a high-carbohydrate diet is best and is intent on showing why. Not only that, she puts forth an extensive listing of "evidence" to support her position and convince her readers! Unfortunately in her zeal to prove a high carbohydrate diet is best, she ignored much of the data available that undermines her position. Not that I’m surprised, after all, she is trying to make the case that if you’re an athlete you’ll do poorly with a low-carb diet! She states, "Here are the top ten reasons why high carbohydrate diets win the race." Before we take a look at her "evidence," let me state the obvious - low-carb diets are most appropriate for weight loss or to manage specific metabolic disorders…and most runners aren't inclined to be severely overweight or obese and I’d hazard a guess that few are suffering with the major metabolic dysfunctions that low-carb diets tend to reverse. That said, there is ample evidence that shows that one can participate in endurance sports, including running, while consuming a low carbohydrate diet and I see absolutely no reason why an endurance athlete won't do well with controlled-carbohydrate dietary approaches. So then, where does Ms. Mueller-Brown start? She starts by laying the foundation that it is well established that high carbohydrate diets are better for athletes and puts forth the current position statements of various health organizations. Nothing new here and no evidence presented to support the idea that low-carb negatively affects performance – she simply states the position of those who are adamant that low-fat, high carbohydrate diets are optimal for everyone.She then moves forward to list the top ten reasons why low-carb diets are bad. Evidence presented to support her contention? None. She does put forth a "logical" rationalization for her position, but no supporting evidence is provided. So, at best this is speculation. The question is, has anyone studied the effect of low-carb diets and mental cognition? Suicide is probably an action most indicative of mental instability. Researchers in 2005 found that it was low intake of polyunsaturated fats that distinguished those who attempted suicide from those who didn’t. Now while this particular study did not compare low-carb and high-carb diets, it is an important piece of the puzzle regarding mental health – and this particular study implicates a deficiency in fat, not carbohydrate, in the diet. Back in 1985, in an absolute zero carbohydrate trial, researchers found that “There was no support for the idea that a minimal-carbohydrate, protein-supplemented fast decreases appetite and elevates mood more in comparison with a similar diet containing enough carbohydrate to minimize ketosis.” This was due to the results showing that BOTH groups of dieters investigated reported similar feelings on their respective diets. In 2002, researchers concluded that “The results show that both absolute cortisol levels and net cortisol increase were greater in the glucose group in comparison to the other groups "
Her real error with this one is her lack of understanding human metabolism. She insists that “glycogen stores constantly need to be replenished with snacks consisting of some carbohydrate." To this I have just one word: gluconeogenesis. 9. Sherman, W.M, Costill, D.L., Fink, W.J., and J.M Miller. Effect of exercise-diet manipulation on muscle glycogen and its subsequent utilization during performance. Int. J. Sport Med. 2:114-118, 1981. 10. Kavouras, S.A., Troup, J.P., and J.R. Berning. The influence of low versus high carbohydrate diet on a 45-min strenuous cycling exercise. Int. J. Sport. Nutr. Exerc. Metab. 14: 62-72, 2004. 11. Widrick, J.J., Costill, D.L., Fink, W.J., Hickey, M.S., McConell, G.K., and H. Tanaka. Carbohydrate feedings and exercise performance: effect of initial muscle glycogen concentration. J. Appl. Physiol. 74: 2998-3005, 1993. 12. Williams, C., Brewer, J., and M. Walker. The effect of a high carbohydrate diet on running performance during a 30-km treadmill time trial. Eur. J. Appl. Physiol. 65: 18-24, 1992. Numbers 9, 11 and 12 are exclusively looking at high carbohydrate and therefore offer no insight into differences between high carbohydrate versus low carbohydrate diets on performance. Number 10 is interesting and does indeed look at the influence of a high-carb versus low-carb diet on endurance. Why she included it as an indictment against low-carb diets is beyond me - here is what the researchers concluded: No significant changes were observed in serum free fatty acid, triglycerides, or insulin concentration in either trial. The findings suggest that L-CHO had no major effect on 45-min cycling exercise that was not observed with H-CHO when the total energy intake was adequate. Now a very interesting look at elite athletes was conducting in 2004, specifically reviewing the diet of elite athletes in Greece. Guess what the researchers found? Mean carbohydrate consumption for male and female athletes was 4.5 g/kg and 3.8 g/kg of body weight, respectively. Fat intake was 153 g for males and 79 g for females… The data suggest that athletes of both genders consumed too much fat and too little carbohydrate. Elite athletes consuming less carbohydrate? Just how do they perform? Dr. Stephen Phinney found that "Impaired physical performance is a common but not obligate result of a low carbohydrate diet. Lessons from traditional Inuit culture indicate that time for adaptation, optimized sodium and potassium nutriture, and constraint of protein to 15-25 % of daily energy expenditure allow unimpaired endurance performance despite nutritional ketosis." in his study, "Ketogenic diets and physical performance"
In another study, The human metabolic response to chronic ketosis without caloric restriction: preservation of submaximal exercise capability with reduced carbohydrate oxidation, he found that "the results indicate that aerobic endurance exercise by well-trained cyclists was not compromised by four weeks of ketosis. This was accomplished by a dramatic physiologic adaptation that conserved limited carbohydrate stores (both glucose and muscle glycogen) and made fat the predominant muscle substrate at this submaximal power level." The immune suppression seen in runners may also be attributed to elevated levels of the stress hormone cortisol and a corresponding drop in lymphocyte production and T-cell activity seen after completion of hard training. Interestingly, low carbohydrate diets, specifically those yielding carbohydrate intakes less than 30 grams, seem to exacerbate this effect. Well, here's a new one. So, what's the evidence? 13. Parry-Billings, M., Budgett, R., Koutedakis, Y., Blomstrand, E., Brooks, S., Williams, C., Calder, P.C., Piling, S., Baigrie, R., and E.A. Newsholme. Plasma amion acid concentrations in the overtraining syndrome: Possible effects on the immune system. Med. Sci. Sports Exerc. 24: 1353-1358, 1992. 14. Gleeson, M., Blannin, A.K., Walsh, N.P., Bishop, N.C., and A.M. Clark. Effect of low- and high-carbohydrate diets on the plasma glutamine and circulating leukocyte response to exercise. Int J. Sport Nutr. 8: 49-59, 1998. 15. Nieman, D.C. Nutrition, exercise, and immune system function. Clinics in Sports Med. 18: 537-548, 1999. Again, we have data that isn't apples-to-apples specifically looking at low-carb versus high-carb except in one reference. So, what does that reference - #14 - tell us? Not much - the researchers investigated the effect of a high-carb versus low-carb diet after just three days of eating one or the other to reach their conclusions. Now this isn't necessary a bad thing, it's just that a good amount of data exist that show an individual needs at least 2-weeks to adapt to the low-carb diet before performance rebounds to pre-low-carb levels. Again, I'll cite Stephen Phinney. Dr. Stephen Phinney found that "Impaired physical performance is a common but not obligate result of a low carbohydrate diet. Lessons from traditional Inuit culture indicate that time for adaptation, optimized sodium and potassium nutriture, and constraint of protein to 15-25 % of daily energy expenditure allow unimpaired endurance performance despite nutritional ketosis." in his study, "Ketogenic diets and physical performance"
Judith Wurtman, director of the Women’s Health Program at the Massachusetts Institute of Technology and the Adara Weight Loss Center, has conducted studies on rats showing a connection between low carbohydrate intake and low levels of serotonin – a neurotransmitter that promotes feelings of happiness and satisfaction. In her research, rats placed on a ketotic, or low-carbohydrate diet for three weeks were found to have lower levels of serotonin in their brains. Wurtman believes that same effect occurs in humans on low-carb diets, leading to pronounced feelings of depression and sadness, even rage. I've heard this one repeated a number of times, and expected to see it here too. 16. Wurtman, R.J., and J.J. Wurtman. Carbohydrates and depression. Sci Am. 260(1): 68-75, 1989. Nothing new since 1989? Wow. Wait a minute, there has to be more research available from the last, oh, 17 years! A study this year, Malabsorption of carbohydrates and depression in children and adolescents, showed some interesting results - 71.42% of those found to be "sugar intolerant" displayed symptoms of depression, compared with just 15% of the control group. In a study in 2002, researchers found that only individuals with high stress sensors (compared with individuals classified as having low stress sensors) were sensitive to carbohydrate in the diet. It was only the high stress sensor individuals who had a measurable difference in mood after a carbohydrate rich meal. In a 1999 review, researchers found vitamin deficiencies were more to blame than macronutrient mix for depression in a wide range of depressed individuals. Can diet affect mood? Sure. But it's not high carbohydrate that's the cure! With a lack of grains, fruits, and vegetables being consumed in low carbohydrate diets, runners run the risk of developing dietary deficiencies of key nutrients including dietary fiber, which can affect digestive health; vitamin C, which can compromise immune function; folic acid, which may elevate risk for cardiovascular disease; and magnesium, which may elevate risk for cramping and also compromise bone health. A lack of fiber also increases your risk for cancers of the digestive track (because transit time is lengthened) and cardiovascular disease (because of fibers effect on fat and cholesterol). Low carbohydrate diets lack in the phytonutrients / antioxidants found in fruits, vegetables, legumes, and whole grains, all proven to aid in prevention of cancer and heart disease. I think in the last six months I’ve provided ample evidence, by way of actual menu samples posted, that if you follow a low-carb diet correctly, you meet or exceed nutrient requirements. The opposite is true of the low-fat diets out there. But, what evidence does Ms. Mueller-Brown provide? 17. Bravata, D.M., Sanders, L., and J. Huang et al. Efficacy and safety of low-carbohydrate diets: a systematic review. JAMA. 289:1837-50 [review], 2003. 18. Brehm, B.J, Seeley, R.J., Daniels, S.R., and D.A. D'Alessio. A randomized trial comparing a very low carbohydrate diet and a calorie-restricted low fat diet on body weight and cardiovascular risk factors in healthy women. J Clin Endocrinol Metab. 88:1617-23, 2003. Not exactly the type of indictment you’d expect for this category, eh? Consumption of carbohydrate-rich foods post-exercise will help enhance recovery from workouts. Carbohydrate-rich foods cause a more rapid rise in blood glucose, which in turn triggers the release of insulin or the “master recovery hormone.” Insulin, the same hormone knocked by Dr. Atkins (Atkins Diet), Dr. Barry Sears (Zone Diet), and Dr. Agatston (South Beach Diet), actually facilitates the transport of carbohydrate, specifically glucose, from the blood into the muscle cell where it can be metabolized to produce energy that will prepare the muscle cell to do work again. Within 30-60 minutes post-exercise, consumption of a carbohydrate-rich snack plus a small amount of protein (e.g., banana mixed in low-fat yogurt) has been shown to triple the rate of muscle glycogen replenishment and muscle protein synthesis. Furthermore, as compared to a protein-only supplement taken post exercise, a carbohydrate-protein solution has been shown to enhance rate of glycogen storage by 5 times, thereby facilitating muscle recovery. Now this one is interesting. It isn’t one of the major complaints you hear everyday. How about we look at the evidence presented to support this contention. 19. Levenhagen D. L. et al. Post-exercise nutrient intake timing in humans is critical to recovery of leg glucose and protein homeostasis. Am J Phys, Endocrin Met. 280: E982-E993, 2001. 20. Zawadzki K.M., B.B. Yaspelkis, J.L. Ivy. Carbohydrate-protein complex increases the rate of muscle glycogen storage after exercise. J Appl Phys. 72, 1854-9, 1992. Her first study didn’t look at low-carb or compare differences in macronutrient mix in the recovery process, so this one is moot. Her second study was an interesting look at ingesting carbohydrate or protein alone after a workout or a combination of carbohydrate and protein. But, it didn’t look at an athlete following a low-carb diet that had adapted to the low-carb diet. Sorry, but this apples to oranges try is not worthy of comment. A review of the literature shows that no one has actually taken the time to study muslce recovery time while following a low-carb diet. So, at best, the jury is still out. With a low carbohydrate intake during endurance training, this is inevitable since there is increased protein breakdown and consequent loss of lean body weight. Furthermore, the biomechanics of your running stride may be negatively affected due to cramping and muscle fatigue (also associated with depletion of muscle glycogen stores), aka “the wall”, thereby causing a variety of new aches and pains as well as muscle tightness. Finally, when insulin levels are chronically low, as they often are with a very low carbohydrate intake, catabolism (breakdown) of muscle protein increases, and protein synthesis is hindered. 21. Kimball, S.R, Vary, T.C, and L.S. Jefferson. Regulation of Protein Synthesis by Insulin. An. Rev. Phys. 56:321, 1994. Interestingly this one is no longer available online – and why should it be, it’s an annual review from 1994! Surely we have more data now, some 12 years later – wouldn’t you think? Like number 5, no studies are found in the literature to really say one way or the other. So, at best, jury is still out on this one too. When following a high protein, low carbohydrate meal plan, both uric acid and calcium oxalate stones are more likely to form. In fact, one study found that consumption of a low carbohydrate, high protein diet for 6 weeks delivers a marked acid load to the kidney, increasing the risk for stone formation. Individuals consuming a higher ratio of protein to carbohydrates run the risk of developing brittle bones or osteoporosis. When the body digests protein, the kidneys work overtime to filter the toxic byproducts produced during breakdown of protein. Once filtered, protein is excreted in the urine; however, along with protein, there is increased urinary loss of calcium, which can ultimately compromise your bone health, thereby increasing your risk for bone fracture. In fact, consumption of a low carbohydrate, high protein diet over 6 weeks has been shown to significantly decrease estimated calcium balance and may increase the risk for bone loss and stress fracture. Injury of the bone will definitely inhibit maximum fitness performance. This one is so old, yet repeated time and again even though there is no real data to support the contention. But, let’s at least give her credit for trying! What eveidence does she provide? 22. Reddy, S.T, Wang, C.Y., Sakhaee, K., Brinkley, L., and CYC. Pak. Effect of low-carbohydrate high-protein diets on acid-base balance, stone-forming propensity, and calcium metabolism. Am. J. Kidney Dis. 40(2):265-74, 2002. Nice try! In this one the researchers indeed made a negative conclusion about low-carb diets, “Consumption of an LCHP diet for 6 weeks delivers a marked acid load to the kidney, increases the risk for stone formation, decreases estimated calcium balance, and may increase the risk for bone loss.” Key word in the conclusion, "may." However, studies that were published AFTER this one shot this idea down quickly. Protein-rich sources such as meats, poultry, seafood, and eggs commonly consumed as part of a high protein regimen contain high levels of purines, which raise blood levels of a compound called uric acid. An excess of uric acid in the body causes gout, which is a form of arthritis. Elevated levels of uric acid in the blood may lead to needle-like uric acid crystals in joints, triggering pain. A new study published in the New England Journal of Medicine has confirmed the correlation between high protein intakes and gout. The researchers studied 47,150 men who had no history of gout at the beginning of the study. During the 12 years of the study, they documented 730 confirmed cases of gout. The relative risk of gout among men was highest among men with the highest intake of meat and seafood. They concluded that higher levels of meat and seafood consumption, like that seen in low carbohydrate meal plans, are associated with an increased risk of gout. 23. Choi, H.K, Atkinson, K., Karlson, E.W., Willet, W., and G. Cuhan G. (2004). Purine-rich foods, dairy and protein intake and the risk of gout in men. N. Engl. J. Med. 350: 1093-1103, 2004. Did this study look at low-carb diets? No. It was looking at the effect of purine-rich foods in a typical diet and the incidence of gout. My take away message - just because someone lists a bunch of research in their bibliography doesn't mean it's applicable to their arguement. I've shown that much of her "evidence" did not look at low-carb diets and those that did actually reached different conclusions than she said they did! I've provided links to every last research study I've countered with - please take the time to read those that interest you so you can gain knowledge about this area of dietary research! Dr. Michael Eades, MD, made a good point today in his blog about the recent study claiming to show a high-fat diet triggers diabetes, "I have known a lot of medical reporters, and none of them in their daily scans of the medical literature would have picked up this article to report on. In fact, I'm quite sure that their eyes would have quickly glazed over had any even tried to read it. So how did it get picked up? Either the journal or the authors themselves issued a press release proclaiming this great discovery. Few, if any, medical reporters could understand this article or its supposed significance, so they relied on the authors to tell them what it meant. These reporters then parroted the authors claims to the world without really having a clue themselves as to what it was all about." You may recall I wrote about this study on December 29, 2005 in Fatty Diet Follies. What's interesting today is that another animal study was just published - this time showing a negative outcome for male mice consuming soy! As Forbes reported in Soy Might Worsen Heart Condition, University of Colorado scientists found that when male mice who carried a gene mutation associated with hypertrophic cardiomyopathy (HCM), a disease in which the heart muscle thickens abnormally, were taken off their normal soy diets, their heart function improved significantly compared to HCM male mice who stayed with soy. The study co-author, Leslie A. Leinwand, chairman of the Department of Molecular, Cellular and Developmental Biology at the university said, "I was struck by the massive impact that diet had on so many functions of the heart -- the all-encompassing effect of diet was so striking." So, how are the researchers and media playing this one? Are they calling for men with heart disease to reduce or eliminate soy from their diets? Are they concerned that men with heart disease may be placing themselves at risk for worsening their condition if they eat soy products? Leinwand is not sounding the clarion call for those with heart disease to avoid soy. "I would feel pretty uncomfortable making any kind of recommendation about what physicians should say to patients, as these are mice, not humans," she said. So, on the one hand we have an animal study, using mice bred to respond to fat in the diet and get diabetes used to sound the alarm that it's a high-fat diet that's responsible for the diabetes epidemic, while on the other hand we have another animal study showing dramatic, negative outcomes but no, no, no, don't even think of considering a caution to men with heart disease - afterall, these are just mice! Can you say "double standard"? When the outcome is favorable to our deeply entrench commitment to low-fat diets, it's OK to use an animal model to make claims to keep going with the belief. When the outcome is negative, well...the study did only use mice, didn't it? If the findings of the most recent long-term study investigating the efficacy of low-fat diets are true, you can expect nothing more than weight maintenance as the result of your deprivation. Heck, you won't do any better or worse than those who do nothing to alter their diet if your weight is what you're looking to change. I'm not a researcher, nor do I pretend to be an expert about study design or statistics. What I do know is how to do math and the simple adding and subtracting of the numbers in this study prove that a low-fat diet does not help you lose significant, appreciable weight over the long-term. It may, in fact, even increase your risk of heart disease and diabetes when waistline and waist-hip ratio changes are considered. Researchers recruited a very large number of women, from diverse backgrounds who were all post-menopausal. They randomly established two groups - one group was given specific instruction, group and individual counseling and support to reduce the fat in their diet; the other group received only a pamplet with diet-related materials. There were some differences in the groups - these were not statistically significant, but are worth noting. In group 1, the average weight was 168.96-pounds at the start, the women averaged 5'3" with a BMI of 29.1 and the average age was 62.3. At the start of the study, the average woman in this group consumed 1788.1-calories per day. This group was the "intervention group" that received intense education and support. In group 2, the average weight was 168.74-pounds at the start, the women averaged 5'3" with a BMI of 29.1 and again, the average age was 62.3. At the start of the study, the average woman in this group consumed 1789.2-calories per day. This group was the "control group" that received only diet-related print materials at the start. At the end of the study, the intervention group weighed, on average, 166.54-pounds - a reduction of 2.42-pounds; the control group weighed, on average, 167.42-pounds - a reduction of 1.32-pounds. So, the intervention group lost just 1.1-pounds more in seven years than the group that was given no support to specifically alter their diet. Where things get interesting is when you look at how calorie intake differed between the groups. Group 1 ate 1788.1-calories at the start and just 1445.9-calories at the end. Group 1 reduced their calorie intake by 342.2-calories a day. Group 2 ate 1789.2-calories at the start and just 1564.0-calories at the end. Group 2 reduced their calorie intake by 225.2-calories a day. But, let's be up front about this - weight loss was not a goal of either group nor was a reduction in calorie intake. It happened though and it should be discussed since we're repeatedly told if you reduce calories and increase activity you will lose weight. And not just a couple of pounds, but significant amounts of weight if you adopt your dietary changes and eat a low-fat diet as your way of eating. As this study gets mulled over more, one explanation is going to be put forth - these women experienced a normal decline in their metabolism as they aged in the study and did not need as many calories to maintain their weight. Guess what? That's true. But, what is also true is that both groups of women were eating a calorie load that should have resulted in weight loss - they were eating less calories each day than they needed to support their weight. If you recall, at the start of the study, both groups averaged the same age and height. Based on these numbers with the average weight at the start, the average calorie requirement to maintain weight - Active Metabolic Rate (AMR) - for the groups was 1854.2-calories each day. They were already consuming less calories than this on average and were still overweight with an average BMI of 29.1. At the end of the study, the women participating had aged 7.5-years and should have indeed had a slight metabolic decline to maintain their weight - their AMR would be 1810.5-calories each day to maintain their weight. But, both groups were eating significantly less calories than their AMR and still maintained their weight! Here's the kicker - both groups also increased their activity level from the start of the study too! So, they were eating less and were more active and still didn't lose any appreciable weight! What happened to "eat less and move more" and you'll lose weight? What happened that the intervention group, eating 118-calories LESS each day than the control group, didn't lose any more real weight than the control group? They reduced their calories, reduced their fat in real grams and as a percentage of their calories and for what? A pound more than the group that ate more over the seven years? Quite frankly a weight loss of just 2.42-pounds over seven years, with such a restriction of calories, is a dismal result for low-fat diets. More important though is that this group actually increased their waistline and waist-hip ratio (WHR) over the period of seven years even with the very miniscule weight loss. That is a danger sign - the dietary approach had a negative effect on a specific health marker - an increase in WHR places one at an increased risk of heart disease and diabetes! Why the researchers are claiming this as a victory for low-fat diets is beyond me. If I were a participant in this study, I'd be angry. I'd be angry my health was put at risk and that my efforts for seven long years were for nothing more than a pound. I'd be looking at the women over in the control group who got to eat as they wished and want to know why my low-fat diet didn't work better than their diet, how they got to eat 38% of their calories from fat when I was made to keep mine below 30%, how they got to eat more calories...all the while my WRH increased along with my risk for heart disease and diabetes! Overall, this large randomized trial demonstrates that dietary recommendations for reducing fat and replacing it with vegetables, fruits, and grains do not increase body weight, which implies that guidelines that restrict fat intake and advocate increases in complex carbohydrates have not been a contributing factor to the weight gain that has been occurring in the United States throughout the past several decades. The above paragraph comes from the JAMA article, Low-Fat Dietary Pattern and Weight Change Over 7 Years, that the press is all over today. I briefly wrote about the study in question last night and today include the full-text link so you can read it for yourself. It isn't often that a prestigious medical journal like JAMA makes the full-text available to anyone - such widespread availability is typically reserved for research findings of great importance for public health. With the popularity of low-carb diets and research findings supporting the efficacy of low-carb diets, the last five years have been a challenge for those staunch in their conviction that a low-fat diet is optimal for population-wide recommendation. This study was over a long period of time - seven-and-a-half years - and anticipated to be a definitive landmark highlighting the efficacy of low-fat diets. This study was anticipated to be the "I told you so" finding many were hoping for, and even though the results are less than impressive, that isn't stopping the hype to convince you that this study had strong results that support the claims of those promoting low-fat diets. Massaging findings is never a good thing - especially when it's patently obvious, and there, staring you in the face in black and white. In this particular publication, the glaring problem is found in the above statement "...guidelines that restrict fat intake and advocate increases in complex carbohydrates have not been a contributing factor to the weight gain that has been occurring in the United States throughout the past several decades." Both groups, in fact, specifically reduced the number of grain servings they consumed each day. While the intervention group did indeed increase the number of servings of vegetables and fruits, this is not an increase in carbohydrate consumed because both groups decreased their calorie intake. So, the net gram intake from carbohydrate actually decreased for both groups! But, that didn't stop the researchers from trying to pull one over your eyes - they state the intervention group increased carbohydrate. They didn't - it's in the data and there is no way around it. Why did these women experience an increase in their waistlines, over seven years, while eating a diet that had fewer calories than at the start? Remember, both groups ate fewer calories at the end of the study than they did at the start - and both groups experienced a similar increases in waistline and WHR. What happened here? It's also interesting that while both groups started the study consuming similar calories, the intervention group decreased their calorie intake by more than the control group over the seven years. Yet, the intervention group had no appreciable weight loss after the seven years of greater calorie restriction. Just how many calories are we talking about? From the data we learn that both the intervention group and the control group consumed similar calories daily at the start - intervention group ate 1788.1 calories a day (mean) and the control group ate 1789.1 calories a day (mean). To keep the math simple, let's call it 1790-calories a day at the start. At the follow up, calorie intake between the two groups was markedly different. The intervention group was consuming 1445.9-calories a day and the control group was consuming 1564.0-calories a day. By my math, that's 118.1-calories a day LESS in the intervention group. If the calorie theory is correct, as so many insist it is, the intervention group should have experienced an appreciable, significant weight loss compared with the control group. They didn't! They ate less calories and remained a similar weight compared to the control group even with less calories. More alarming though is the increase in waistline and WHR in the intervention group - the reduction of calories did nothing to stop fat accumulation in the waistline! But the press is working hard to convince you that this study is somehow proof that a low-fat diet is healthy! Don't fall for it! These women decreased calories, lost no weight and experienced an increase in their waistline and WHR - they increased their risk for heart disease! The Miami Herald article, Study examines Low-fat, high-carb diet, opens with the following sentence: Older women who ate less fat and more carbohydrates lost about 2 pounds over seven years, a large study showed. Too bad it's not true. Too bad Carla Johnson, the author of the above article, didn't bother to read the full text of the published JAMA article to know it's not true! After receiving a head's up about the soon-to-be released study, I decided to read through the full article I was provided in advance to see what the fuss was all about. Saying I was underwhelmed by the actual data is a fair statement. So, what was this study all about anyway? Well, it followed more than 48,000 women (post-menopausal) for a little more than seven years, with the women randomized into two groups - Group 1, made up of 19,541 women, was the "intervention group" that was provided with specific instruction, group and individual sessions to promote a decrease in fat intake and increases in vegetable, fruit, and grain consumption without weight loss or caloric restriction goals; Group 2. made up of 29,294 women, was the "control group" that received only diet-related education materials with no instruction about changing their diet. Each participant was evaluated at the start for "baseline" numbers about participants of each group. These women REDUCED THEIR CALORIES - both groups! Not only that, they DID NOT increase carbohydrate consumption - in fact both groups actually DECREASED their intake of carbohydrates! Look at the data again! At baseline, the intervention group was consuming an average of 198.9g of carbohydrate each day - at the follow-up, they were eating just 190.45g! Now who wants to tell me they "INCREASED" carbohydrates? Who do they think they're kidding here? At baseline the control group was consuming an average of 199g of carbohydrate each day - at the follow-up, they were eating just 174.95g. Again, a reduction in carbohydrate intake! Oh, that's right - the intervention group "increased" carbohydrate if we look at the percentage of calories. But, don't lose sight of the fact they DECREASED calories - so their "increase" is not an actual increase in carbohydrate intake, just fuzzy math using percentages of calories! But, hey this reality didn't stop the lead author, Barbara V. Howard, from claiming her results "...will help people to understand that the weight gain we're seeing in this country is not caused by the lower-fat diets." What part of a calorie reduction of 322.2 calories a day did she miss? If nothing else, this study should set off alarm bells that restricting calories to 1445.9-calories per day, down from 1788.1-calories per day, does nothing significant to reduce weight! Can you imagine cutting your calories that much and seven years later your BMI is still at the upper end of overweight, bordering on obese? Not in my book. No thanks! I'll stick with controlled-carb and eat rich, nutrient-dense foods!